What does a tech start-up from Ostrava have in common with global companies like Apple, Audi, LG, Philips, Ferrari or Porsche? The answer’s simple – just like these brands, the team at Invent Medical has won one of the world’s most prestigious design awards. 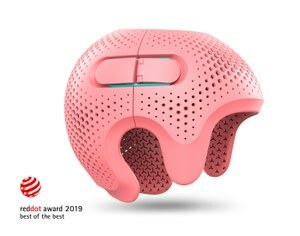 The Ostrava-based company recently won two awards for its innovative 3D printed medical devices – the Red Dot Award for high-quality design, and Red Dot: Best of the Best for an outstanding product setting the trends in global design. Red Dot is one of the world’s premier design awards, with over six decades of history. For the most recent awards, the jury selected just a few products out of a total 5500 entries from 55 countries – around 1% of entries received the Best of the Best award. Experts from the jury praised Invent Medical’s high design quality, innovative approach, and potential to set new global trends in their particular area of the health care industry. The company received the Best of the Best award for its cranial remodelling orthosis, which is used to treat severe skull deformities in newborn babies. The Red Dot Award went to the company’s design for 3D printed orthopedic inserts. Invent Medical develops advanced 3D printed custom-designed orthotic and prosthetic productswhich help people recover after surgical operations or injuries and are used to treat congenital deformities or compensate for the loss of part of the body. The company’s mission is to provide patients all over the world with brand-new products offering substantially higher levels of comfort, functionality and attractive appearance. ambition is to become a global technological leader in the field of custom-made orthotics and prosthetics. The company recently opened a branch in the USA, and it is currently expanding its presence at health care facilities in Western and Northern Europe.